I was born in 1965 in Torino, Italy, and was only 4 when Armstrong and Aldrin were on the Moon. My parents woke me up to see history happening. I work as an engineer. I have also commited myself to making information about astronautics and space available in the Italian language using blogs, forums, magazine articles, and as a board member of ISAA, the Italian Space and Astronautics Association. There can never be enough thanks to my wife Manuela and our daughter Viviana for the patience and all the support they give to me. 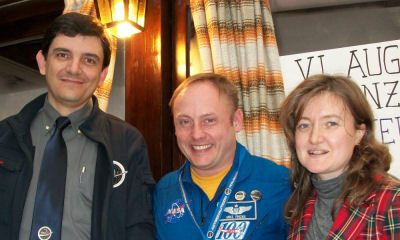 The photo shows Manuela and me with NASA astronaut Michael Fincke, who was Guest of Honor at the 4th annual AstronautiCON in November 2009 at Lecco, on the shores of Lake Como.